Wicked, The Untold Story of the Witches of Oz has started its run in Manila last weekend. I am so sad I cannot be there to watch it. I am "green with envy." I only learned about this musical in the last couple of years. Actually, the movie Oz the Great and Powerful gave me the idea what Wicked is all about. The story about the witches in the Wizard of Oz. Pretty interesting for me. A few of my friends raved about the musical. If they like it, I would surely like it, too. "The musical is told from the perspective of the witches of the Land of Oz; its plot begins before and continues after Dorothy's arrival in Oz from Kansas and includes several references to the 1939 film and Baum's novel. 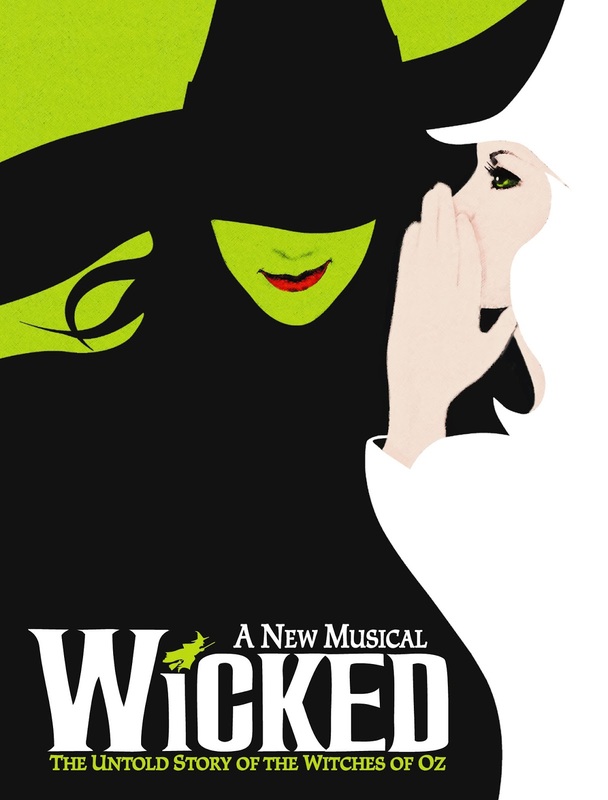 Wicked tells the story of two unlikely friends, Elphaba (the Wicked Witch of the West) and Glinda (the Good Witch of the North), who struggle through opposing personalities and viewpoints, rivalry over the same love-interest, reactions to the Wizard's corrupt government, and, ultimately, Elphaba's public fall from grace." I am more intrigued and wanted to see the musical so badly. I am no longer the little girl who only knew about Dorothy, the scarecrow, the lion, the tin man and the dog, and there is actually more to the story. I wish I can say I knew about this song from the musical sang by the wonderful Idina Menzel. But I can't. I first heard this song in Glee (the TV show) sang by Lea Michele and Chris Colfer. I loved it right away not knowing where it originated. The performance of the original Elphaba (Idina) and Glinda (Kristin Chenoweth) at the Tony Awards is a must watch. I adore Idina in Enchanted when she played Nancy. I realized later on she did not sing in the movie. What a waste of talent. But I guess the movie producers deliberately did that so she won't overpower the non-singer actors. Then she was the perfect fit to be the biological mother of Rachel (Lea Michele) in Glee. And of course, right now, we all fell in love with the Elsa in Frozen. The success of the song "Let It Go" is phenomenal. As soon as I came out of the moviehouse, the song was repeatedly playing in my head. When we reached home, my husband and I both purchased the Frozen soundtrack on iTunes. 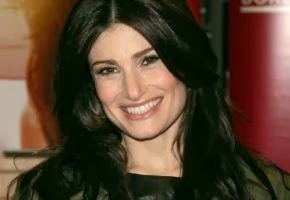 Idina is the original Elphaba. She won a Tony Award for the role. What an amazing woman. I got the idea from my sister as I was whining the other day how I am so envious she'll get to watch Wicked. She gave me this far-fetched idea of watching Wicked in New York City. And that was instantly added to my bucket list. Have you seen Wicked the musical? Did you love it or hate it? I have gotten back to working out. I NEED TO. Grateful for a supportive husband who watches over our sons while I sneak out of bed during weekends to do cardio exercises. Working out without listening to anything is boring. Yes I could listen to upbeat songs but it's not enough for me to stay focused. I realized listening to podcasts makes working out more bearable for me. Better than watching an episode of a TV show or parts of a movie. It's also multitasking for me. I work out at the same time I catch up on my weekly podcasts. 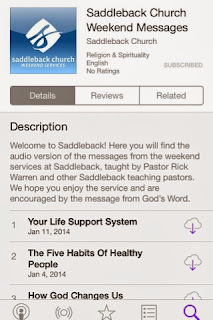 Saddelback Church's current series is called the 50 Days of Transformation. Last weekend's message was Setting Goals by Faith. Catchy enough for you? It is for me. Very timely as I am going through Prayer & Fasting this week. I always learn so much from their Founding and Senior Pastor Rick Warren. 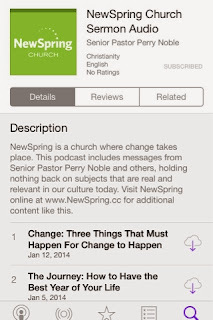 While NewSpring Church is not as popular as Saddleback Church, I subscribed to their weekly sermon. Their Founding ang Senior Pastor Perry Noble has so much energy that I think it passes on to me when I listen to his messages. 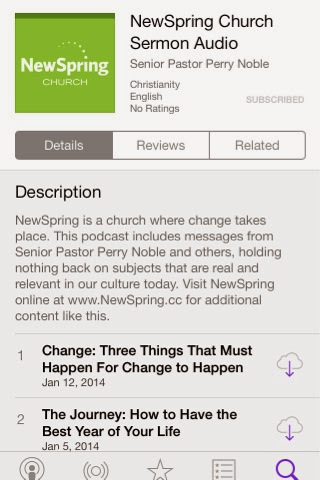 Their current series is Change, and last week's sermon was The One Thing That Changes Everything. 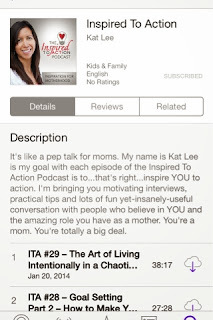 Inspired to Action is a blog for stay at home moms like me It's author Kat Lee is a stay-at-home who has already launched e-books and podcasts. She's been an inspiration. She's partly Filipina because of her mom. On her podcasts, she gives practical tips on managing the household, parenting and discusses current issues this world faces. Her current podcast is an interview with another mom blogger entitled, The Art of Living Intentionally in a Chaotic World. 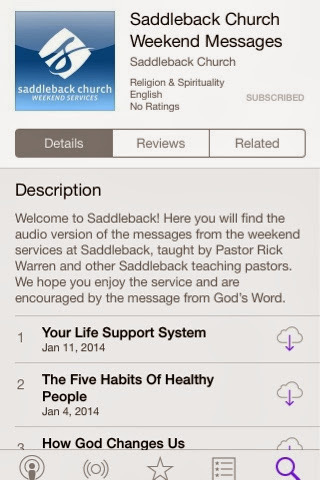 You may subscribe to all three podcasts through iTunes. Links provided above by clicking on the podcast titles. Their one thing in common is they are all Christians. And I need to listen to people like them all week long. I have to be constantly reminded and surrounded with God's Words. 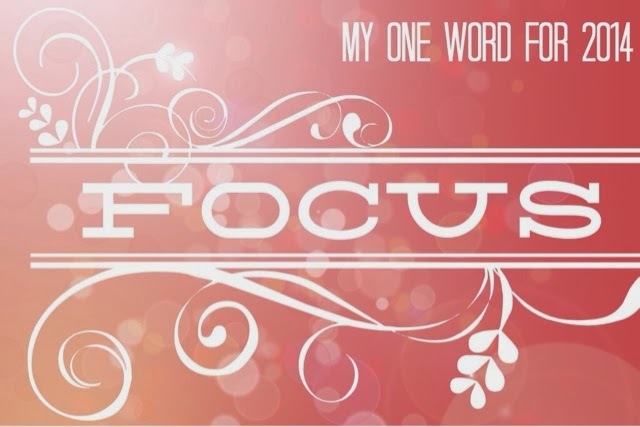 It has a positive effect on how I go through my day, how I deal with my husband and two sons and how I handle crisis. Hope your week had been productive! There are two things I enjoy doing and want to do more of: blogging and baking cupcakes. 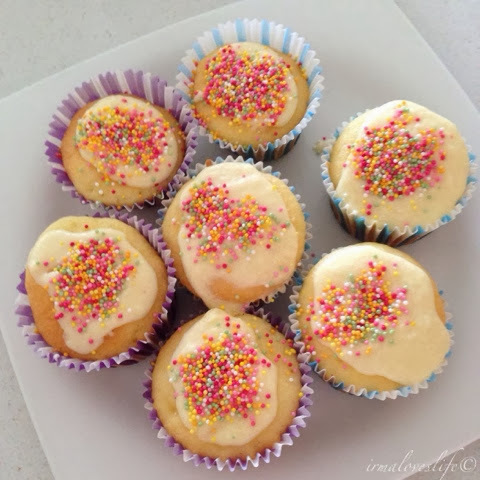 Yes, just cupcakes. Since I do not have the kitchen space nor enough time, I'd have to rely on cake or cupcake mixes. They'd have to do for now. 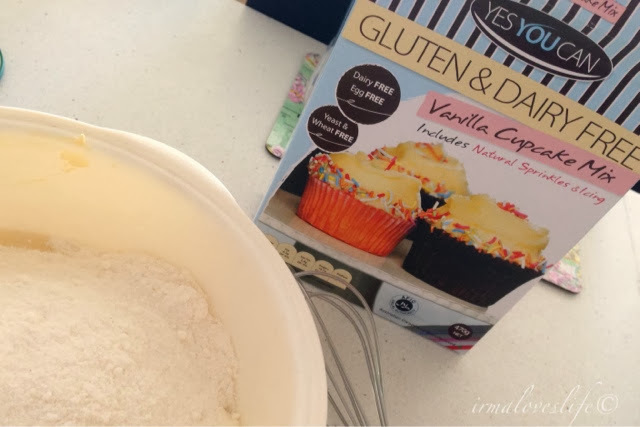 I picked up this box of gluten and dairy free cupcake mix. 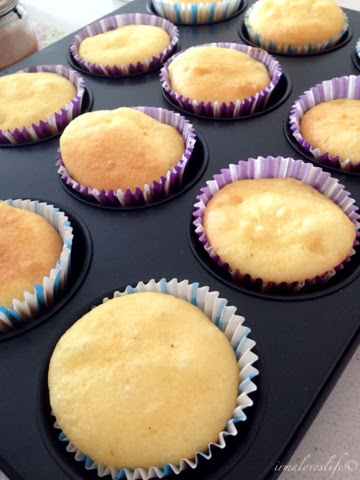 And yesterday I had the time to make cupcakes. Yes You Can cupcake mix. Gluten and dairy free. This packet is the frosting. 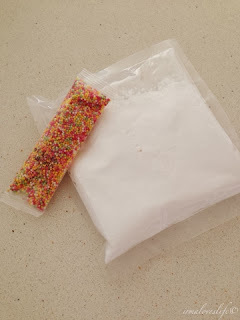 My son loves the candy sprinkles. The verdict: we like them better than Betty Crocker's cake mixes. We found Betty Crocker's too sweet. 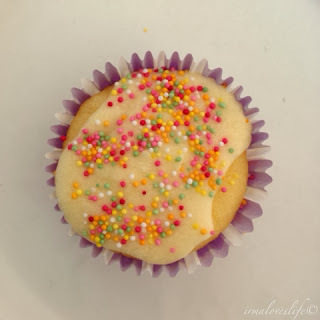 Yes You Can cupcakes are delicious and more healthier. I am looking forward to making another batch of cupcakes next month. Yes You Can has other mixes I'd lime to try such as banana bread, chocolate cake, pizza crust and savory snacks. 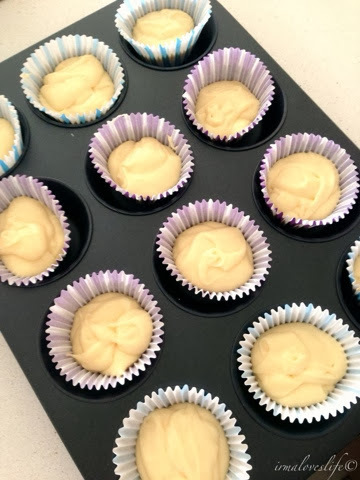 Till my next baking session! Enjoy the weekend. I used to talk about my collection of city mugs all the time. That was the height of my collecting. And I needed a lot of help (from anyone) at that time. 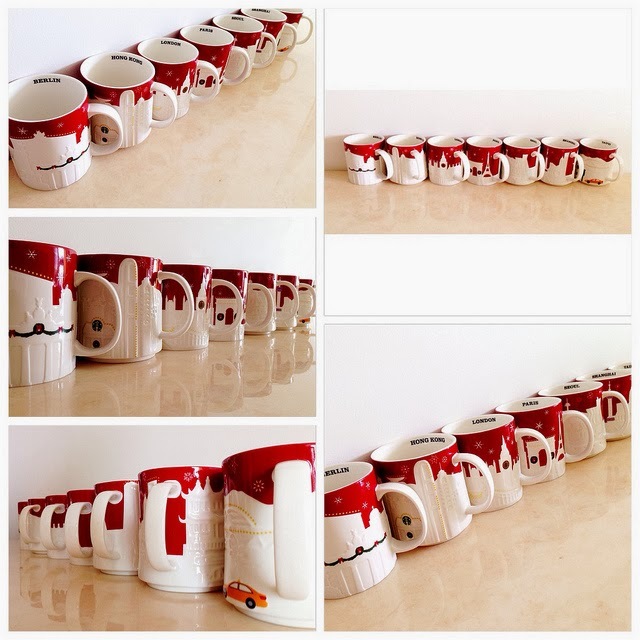 My hunting for mugs officially started July 2011. I had less than 10 mugs then. And now January 2013, I have 310 mugs. Gasp! I can't believe it. And that's why I am keeping quiet for now. I have way too many mugs. I still don't have a display shelves for them. It was my supposedly big project last year but I got pregnant. The pregnancy trumps everything else. So I need to wait until my children are older before I can display my mugs in shelves. I have two boys. The chances of them breaking the mugs on display are very high. So where are my mugs? Around a hundred are displayed. A third of the collection is in the Philippines. The rest are in their original boxes inside our spare cabinet. Currently, there are 339 mugs in the series I am collecting. I am missing 29. Those would be the new releases and the discontinued ones. The new mugs are easy. And the more patient I get the easier it'll be to find them. I'll never complete them anyway, the discontinued mugs are horrendously expensive. I would need around a thousand dollars each. So forget about them. Apart from the icon series, I wanted a Christmas version. Again, the old ones are very expensive they are out of the picture. For the last holiday season, Starbucks released the Christmas version of the Relief series. There were only 7 cities so I completed them. Yay! There are these two mugs whose design I love the most. They are white on the outside with logo etched in front. 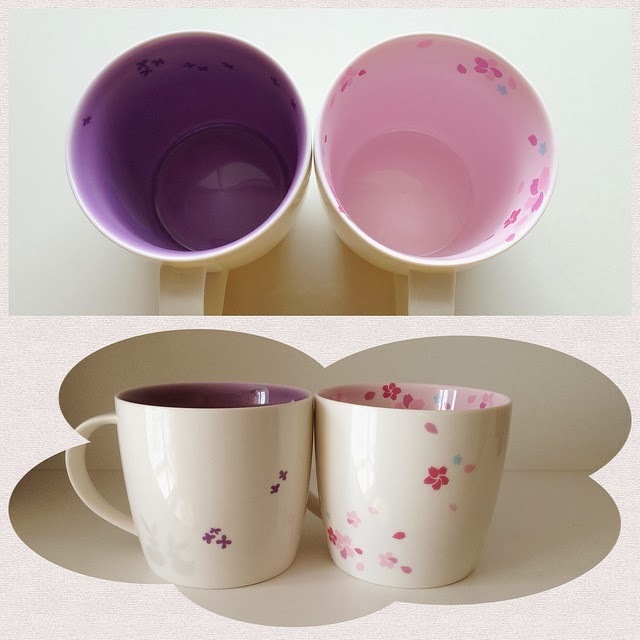 The colors are inside and the little details such as flowers are scattered around the mug. If Starbucks will release more I will get them. I use this two for my morning coffee. And that.s my yearly update. The collecting continues but I have definitely slowed down. What's the thing you collect? Are you also into mugs like me? Share! 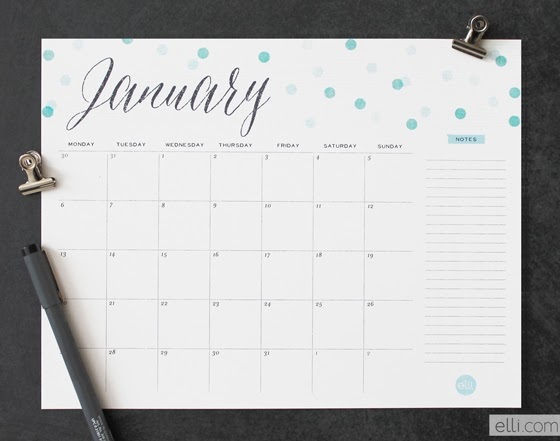 The new year means we need to change our calendars. 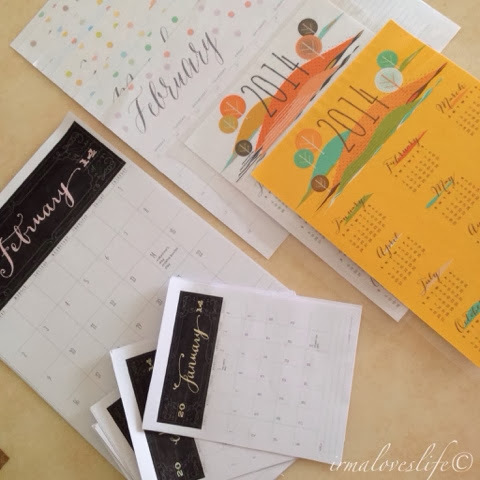 Years ago, I bought calendars or used those freebies given by companies. There were really pretty calendars. 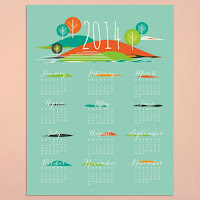 I particularly liked the desk calendars from hotels. It was easy to get them when I was still working. 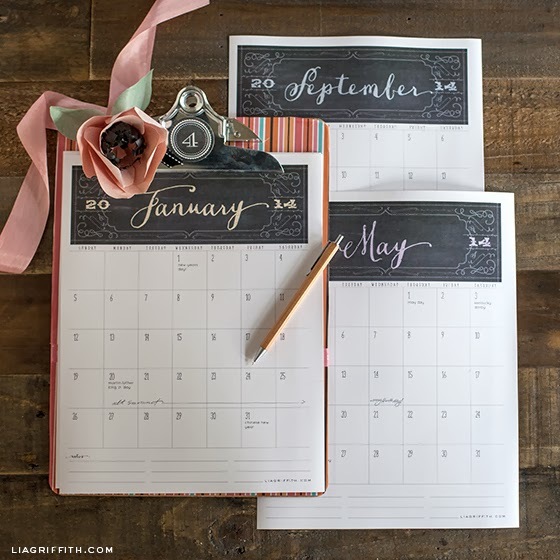 Being a mom and running a household, I realized I need a calendar in every room of our home. Thanks to women bloggers with a knack for graphic design, I get beautiful calendars for free. All I have to do is download them then print. I choose a couple of designs. I prefer those calendars with weeks beginning on Sunday. I print them in several sizes according to my need. I laminate the year at a glance ones as I will use them longer. I write on the monthly ones, so I print them on regular bond paper. Card stock is preferable but I ran out of those. To download the calendars, please click on the caption below each photo. Another great resource is the Mein Lila Park blog, links of over 40 free printable calendars were compiled here. I hate the word resolution. My resolution lists never gets done. And that is the reason why I'd rather keep life simple and write down things that would be nice to accomplish every start of the year. I also believe in the One Word method. Choose a word and it'll be the "theme" of my entire. it actually is workable than resolutions. 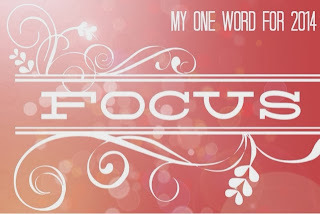 As my church goes through a yearly Prayer and Fasting, I incorporate my one word and the list of things I'd like to accomplish with my faith goals. At the end of the year, I don't feel bad if I only accomplished a few on my list. God is full of surprises. It shows how I am not in control but He is. And His plans for me are way much better than what I have in mind. If there is one place I'd like to go back to, it'd be Cebu City. A new place I would like to see is Siem Reap. Yes, it'd be more difficult with a baby and toddler but if we don't try to go this year, when will we have the chance, right? Gotta get something done. It's a crazier life with two kids. There are times when I would just because I am too overwhelmed. It is manageable though. God's grace and the Holy Spirit. I feel I am such a scatter brain that I need to refocus. This, I think, is the key to accomplishing my goals for this year. It is also important that I do not lose sight of the things that matter and those that need to be my priority. In all these goals and one word, I need God as I can't do it on my own. 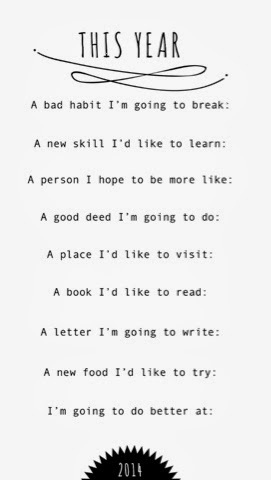 What are your goals and one word for this year?